Spacieuse villa ensoleillée plus chalet, à proximité de belles plages. Belle villa spacieuse située dans des jardins paysagers avec sa propre piscine. À quelques minutes à pied de deux belles plages, où vous trouverez des bars de plage et des restaurants merveilleux. Vous pouvez soit passer une journée tranquille à côté de votre propre piscine, soit vous aventurer sur les plages locales et regarder des couchers de soleil incroyables tout en sirotant les coups de rhum locaux. Mais soyez prudent de leur donner un coup de pied. La villa dispose de trois grandes chambres doubles deux avec leurs propres suites et une troisième avec salle de bain. La troisième chambre est dans le chalet, de sorte qu'il peut fournir un peu d'intimité supplémentaire si nécessaire. Ouvrez les portes doubles du chalet et donnent sur les jardins paysagers et la piscine. Si vous aimez vivre à l'extérieur, c'est la villa pour vous, assise surplombant la piscine tout en préparant un barbecue, quelle meilleure façon de profiter d'un sundowner avec des amis. Quand et si vous devenez fatigué de soleil, si cela est possible, il y a WIFI pour vous tenir en contact avec le monde extérieur, un salon confortable où vous pouvez regarder des films de votre choix ou rattraper le dernier épisode de votre préféré savon. Il y a un nettoyeur deux fois par semaine, assez pour garder les choses bien rangées, mais pas trop pour déranger. Près de Holetown, où vous trouverez des boutiques de créateurs, des maisons Chattel avec de l'artisanat local, de merveilleux restaurants, des bars et de nombreuses animations en soirée. La villa dispose de portes électriques, donnant intimité et sécurité, avec un espace suffisant pour garer une voiture, s'il est embauché. Il est possible de ne pas louer une voiture, mais il est recommandé de faire de la vue sur cette magnifique île. Avec tous les conforts de la maison, AC dans toutes les chambres, cuisine bien équipée, lave-vaisselle, lave-linge, sèche-linge, TV avec lecteur DVD. Thank you Maria, so glad you enjoyed your stay and everything was as you had wished for :-). This was our second stay at Strollers so we had high expectations which were all met! Paula gives immediate responses to any questions prior to the visit and Geoff and Kerri Ann once again were great. We utilized the kitchen more this visit. It had everything we needed. We did not experience any issues with the dogs next door. The only time they barked was when someone walked by their villa which was very infrequent and only during the day. I would highly recommend this villa. Thank you for such a lovely review I will let Geoff and Kerri Ann know how much you enjoyed your visit, they will be so pleased. It was lovely to have you stay at Strollers again, I'm so pleased, that you and your group enjoyed it. It means a lot to all of us that you stay went well and we would love to see you again. My husband and I stayed in the villa for two weeks and a couple of friends joined us for a few days. They stayed in the Cottage which they enjoyed. We really liked the villa, there was plenty of room, although we never sat in the lounge, as the outside space was particularly nice. The villa was spotlessly clean and job well done by Kerri Ann, who visited us twice to clean and change the bed linen. Geoff the villa manager was very helpful and kindly organised some provisions for our arrival prior to a supermarket shop. Andrew the taxi driver was great too, as we ate out every night he was always on time both going and returning. My initial experience of booking with Paula was excellent as there was no waiting for a response - great. The pool was a nice size to allow a good swim. As well the pool area was in sunshine all day until 5.00 pm which was lovely. We lazed by the pool every day as we are not beach lovers, so this suited us perfectly. The only slightly negative point, which ironically is nothing to do with the villa, but the house next door had four large guard dogs who quite often barked loudly during the day for periods of time. Whilst it wasn't a show stopper, at times it was a bit frustrating, as otherwise, the villa and area was extremely quiet and peaceful. All in all we had a lovely time at the villa and thoroughly enjoyed our time there. Thank you for the lovely review, I will pass on your comments to Geoff and Kerri Ann, its always nice for them to hear that you enjoyed your visit. Sorry about the dogs I will have a word with my neighbour. Glad you had a good time, if you would like to return, please do not hesitate to contact me. We had the family in Barbados for two weeks and happened to spot this little gem last December. It was our first booking through HomeAway. My first contact with the owner, Paula Jack, was met with an immediate response and she was very engaging from that point right the way through the booking process and during our stay. Nothing was too much trouble when we needed clarification or an inside track on something prior to our arrival. Paula uses a local support, Geoff Fox, he is wonderful and arranged for everything to be just right during our visit. He is easily contactable and knows the island and the people really well, any problems and Geoff will sort them, without fuss and very timely. Kerry is the house keeper and is a very sweet Bajan lady who makes sure the house is clean and in order. The property is a stones throw from Holetown and is perfectly situated to visit the West coast and its many beaches. We had a car which we found invaluable in getting around the island and popping to shops and beaches, the pool is nice although we didn’t really use it as we visited the beach everyday as we prefer to swim in the sea and snorkel. Strollers is in nice gardens with a great pool house which is a third bedroom. My brother and his wife frequented to get a bit of privacy and quiet time which they loved! Strollers is well equipped with kitchen utensils and is a really comfy base, we liked to get fresh red snapper from Payne’s bay and have a bbq a couple of nights whilst the lads also liked to go to ‘Just Grillin’ which is just past Massey supermarket in Holetown, 5 mins drive away. We also ate at a lot of local restaurants which are in easy reach of the property, great sundowners at Zacchios too to watch the memorable sunsets. Lone Star was a real treat to have dinner at, our favourite beach was at Ju Ju’s where we ate lovely freshly cooked food at lunchtime. Rico and his team who provide beds, water sports and anything else you need are brilliant too! Thank you Paula, Geoff and Kerry for making our stay so special whilst we were in Barbados. We will be visiting again and Strollers really did make the holiday a great place to base ourselves from. 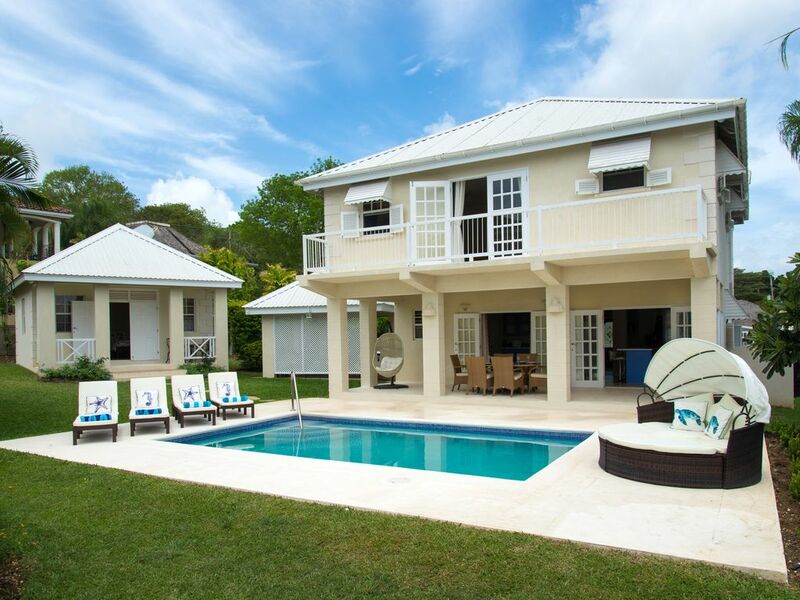 Nice villa close to Holetown. Villa was clean and has a separate building for the third bedroom. The pool was a nice addition and well maintained - cleaned twice in the 10 days we were there. The villa was also cleaned twice during our stay. The property manager was readily available and very accommodating. Villa is a short walk to what we thought was one of the best beaches and a short drive into town with many restaurants. We would stay there again. Thank you Bob for your review, so glad you enjoyed your stay and that Geoff and Kerrie looked after you well. If you decide to return the Island it would be lovely to stay with us again. "Strollers, is an absolutely beautiful, island villa! We arrived a bit later than expected, but the property manager Geoff was on hand to meet us and walk us through the house! He's such an awesome upbeat guy, who made sure everything was perfect from check in to check out! He's also a big drone fanatic like we are so there was loads to talk about always! The house is just stunning, with well manicured lawns, and a to die for SALT WATER pool! What an awesome addition and pleasant surprise! The main house is spacious and airy with tasteful island decor accents. The cottage, which is a third bedroom is a big plus offering total privacy and was perfect for our travelling party. Our favorite part of the house was the kitchen and outdoor patio which is adjoining. This was no doubt our main stay and here we hung out the most! Great for entertaining! The cleaning service came in twice weekly to make sure we were well stocked and pristine always! Kerrie was the sweetest! Thanks Geoff & Kerrie for being such an awesome team and offering us a memorable stay in Barbados!"